Save $10 when you order 2 or more! These are the same bats DBAT makes for the Pros. High quality ash wood with 15 grains or less. Pick your bat model, then pick your colors! 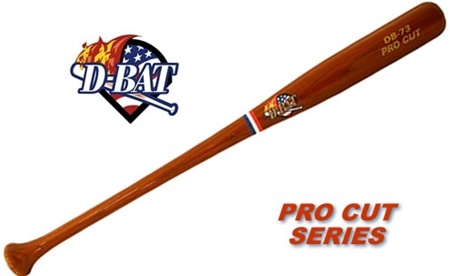 Choose from 14 different models in D-Bats's Pro Cut ash bat series. Bats are cupped and the Length/weight ratio is their standard -3. See the chart below for differences between the models. Add a Laser-branded signature for $7.50 extra. Note: photos below are of the Pro Stock series, but bat model shape is the same as Pro Cut. Customize your bat! Choose the barrel and handle color from these available colors.